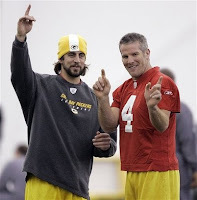 Here I am preparing a post previewing the Green Bay Packers' open quarterback competition between a guy that has 441 more career touchdown tosses than his closest competitor and then the news hits the fan. "This probably isn't going to work." Those are words generally reserved for guys trying to break it off with a stage five clinger. Instead, with those six words, the 15-year relationship between Brett Favre and the Packers looks to be coming to an end. Will Favre be released to the open market or seek a trade with the teams he tortured the most, the Minnesota Vikings or Chicago Bears. Or maybe the quarterback-less other team from New York or the QB collector Jon Gruden in Tampa Bay. This is a disappointing end to a saga I was sure would end with a shot fired from a grassy knoll by an Aaron Rodgers-hired sniper. All jokes aside, there's nothing like pushing out the face of your franchise. Ask Jerry Reinsdorf. Now Favre, who will be a motivated gun-slinger by the time Opening Day rolls around, will be moving on and I'm damn sure he'll be looking to rack up about five TDs and 500 yards against his former mates just to spite a front office that has tried desperately to rid itself of its flip-flopping crazy-clingy ex-girlfriend.